In *Keepers, Contemporary romance, Crime & mystery, Reviews, Romance, Romantic suspense. 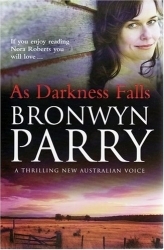 The first I heard of As Darkness Falls by Australian author Bronwyn Parry was a small blurb in the Dymocks Booklovers catalogue. I was intrigued because it sounded like a romance (just because the catalogue says it’s romance doesn’t necessarily mean it’ll be genre Romance), it’s set in Australia, and it looked meaty. When I finally got my hands on the book, the cover promises: “If you enjoy reading Nora Roberts you will love…” That is a big call, I thought, especially since it’s the author’s first novel. But after reading As Darkness Falls, I think it really is a book that Nora Roberts fans might like. It’s a shame, then, that so few Australian romance bookstores have it in their catalogues. As Darkness Falls centres on Detective Isabelle O’Connell, who has isolated herself from society to recover from some serious personal trauma resulting from an investigation into a child killer. Not only had she been unable to find the killer in time, she had been unable to protect a local suspect from falling victim to an angry mob. But when she receives a visit from Detective Chief Inspector Alec Goddard informing her that another girl has gone missing in her hometown of Dungirri, Isabelle is compelled to go back home and help solve the case. Alec feels guilty about using Isabelle in the investigation, but he’s determined to find the missing girl. Unexpectedly, Alec finds himself unexpectedly drawn to Isabelle despite the fact that he has his own reasons for not wanting to let anyone into his life. For Alec, the case becomes increasingly personal as Isabelle herself becomes part of the killer’s game. Isabelle’s fragile emotional state is further challenged as evidence mounts that the person they’re looking for is a local member of the community–a killer who gets more daring by the day, and whose every move seems calculated to test the very terrors that Alec and Isabelle are struggling to overcome. The romance between Isabelle and Alec develops slowly and believably. Although the crime investigation takes centre stage in the earlier part of the book, we get a glimpse of the growing attraction between the main characters. This is wonderfully understated most of the time, which I think echoes a practical sort of Australian sensibility that’s in keeping with the setting. It was refreshing to read about these characters who felt real to me, and whose manner of expressing affection and desire bear some resemblance to how I think most people fall in love. Alec is portrayed as a man who won’t take crap from people, but who is capable of great compassion and empathy. Parry explores his character by his actions and reactions as a boss, an investigator, a friend and a lover. He never descends into a stereotype, and even when he feels jealousy against men from Isabelle’s past, he doesn’t resort to playing boorish games. The one thing that didn’t quite work for me was Alec’s main internal conflict about being in a relationship with Isabelle. I felt that this wasn’t well integrated into the story and came across as something tacked on to prevent the romantic plot resolving earlier than the suspense does. And yet it could have been a real obstacle to the romantic plot, so I wish Parry had woven it into Alec’s story better. Isabelle is a complex mix of toughness and vulnerability. Again, Parry imbues the character with an Aussie sort of disposition in which the practical concerns of everyday life, of the tasks at hand, take precedence over whatever internal struggles she’s going through. This makes Isabelle’s emotional turmoil that much more powerful when Parry lets us into the character’s head. At the same time, it removes any doubt that Isabelle is capable of being part of the investigation even when she’s at her most vulnerable. What I love most about the relationship between Alec and Isabelle is that it’s underscored by mutual respect and a gentleness that contrasts with the violence they deal with as part of their jobs. I love that Alec gives Isabelle space to be herself, providing support while Isabelle tries to repair her emotional wounds, without asserting himself as any kind of saviour. At the same time, Isabelle rebuilds relationships outside of Alec, so I never feel as though he’s just a crutch for her. ‘Get it down to ballistics in Sydney,’ Alec replied. ‘Call in a crime scene team to go over the creek area straightaway.’ He stopped as Kris shook her head. He stared at her in disbelief. How could they be expected to conduct an investigation without the resources they should be able to count on — resources he took for granted in Sydney? ‘Welcome to bush policing,’ Isabelle commented dryly. ‘Murri,’ Isabelle corrected him, her eyes cold. ‘The Aboriginal people in this region call themselves Murris, not Kooris. And learning to read the environment is a survival skill that takes years of observation and practice, irrespective of one’s genetic inheritance. As Darkness Falls is an excellent debut novel, and it makes me so glad to finally read an Aussie romance that never once had me rolling my eyes. You can read the first chapter here. If you’re still not convinced, I’d encourage you to check your local library. 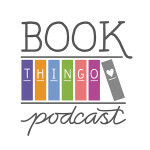 If, like me, you’ve basically been reading decades worth of US-centric romances, you may find something refreshing and real and genuinely touching in this novel. A shorter version of this review was submitted to the ARRC09 Reader Challenge. To enter the contest, this review was modified to fit the word count and contest rules. If you’re signed up to the ARRC Lounge, please vote for your favourite review (no, it doesn’t have to be this one). AUSTRALIA: Dymocks | Ever After | Fishpond | Galaxy | Intrigue | Rendezvous | Romance Direct | Romantic Reflections | Siren | More (no online catalogue) Psst … where are these stores? 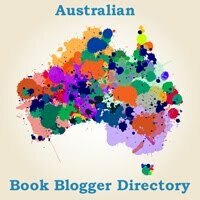 Tagged australian authors, australian characters, australian romance, bronwyn parry, rural romance. I really loved this title too, loved the depth of the characters and that Parry didn’t take the stereotype route. They were real and engaging with realistic conflicts. Great review! Thanks, Jayne. :-) I have to reread this book because it’s been a while. I do remember that I loved that the crime bit was pretty solid, but that the romance was also lovely.